CATBALOGAN, Samar – Calbayog City is now busy in the preparation for the Eastern Visayas Regional Athletic Association (EVRAA) meet in Calbayog City in February, 2011. EVRAA Meet is set to open on January 30, 2011 in Calbayog City. The working committee included Representatives from DepEd, Mr. Raul Agban, City Disaster Risk Reduction Management Officer Mr. Estanislao Cortado and City Administrator Mr. Emerlito Montealto attended the meeting. It was learned that the approved budget allocation for the EVRAA meet is P 5 Million. Agban of DepEd shared that there will be an installation of temporary bath and comfort rooms for the billeted schools. Some amount will also be used to prepare the playing grounds and other areas to serve as athletic venue. Athletes will use the Calbayog City Sports Center, Brgy. Trinidad Covered Court, the New Terminal in Barangay Bagacay, and Marju Krisel pool for the swimming event. Another concern that the group wants to overcome is the budget for the cultural presentation on the opening day which they said is not yet included in the P 5 Million budget allocated for the EVRAA. In the presentation, some 30 high school students from 15 schools in the city are expected to participate. The budget only include the opening and closing ceremonies, food for the delegates and the fund needed for the twenty (20) days training before the opening. CAMP LUKBAN, Catbalogan, Samar – Member of the notorious New People’s Army (NPA) was killed in an early morning encounter with the troops of the Army’s 34th Infantry Battalion in the periphery of Brgy. Mahanud of the interior municipality of Matuguinao, Samar 1:30 a.m. today few hours after the culmination of the holiday truce. According to the report, 34IB received information from some civilian residents in Matuguinao that a group of heavily armed men are extorting food stuffs and consolidating in that area, and planning to harass the isolated detachment in San Jose de Panaugan, the last barangay of Gandara before Matuguinao. Tipsters further revealed that the harassment will be carried out to welcome the termination of the government’s declaration of cease fire. It can be remembered that cease fire has started last December 16, 2010 and ended in the eve of January 3 to give time for the holiday festivities. To preempt such another terrorist deed that will demoralize the new hope of the peace-loving people this new year, the commanding officer of 34IB Lieutenant Colonel William Peňafiel sent out some of his troops to assure that terrorist could no longer execute their evil plans. It then resulted to an exchange of fires between the two groups that caused to the killing of an unidentified NPA terrorist and hurting a CAFGU Active Auxiliary (CAA) identified as CAA Duran. Mahanud is just a 30-minute hike from the town proper of Matuguinao at an estimated 7 kilometer distance. Also seized from the rebel group are one (1) M16 rifle, personal belongings and other war items. The cadaver of the slain rebel is still in the area as of press time while the wounded CAA, is now in Tacloban City and undergoing surgical operations. Meanwhile, Major General Chan, 8ID’s commander has already commended his troops for proactively foiling and thwarting the supposed enemy’s attack. “This feat is another manifestation of how dedicated our troops are in protecting the people against these groups that sow terror to our peace loving Samarenos”. He once again recognized the unwavering support of our people. According to him, the incident could count that insurgency cannot be totally obliterated by a mere military solution. Thorough collaboration between the civilians and the soldiers is needed. “As I was saying in the past, this feat can be attributed to our people because our services can just be fully carried out if our people’s concern remains to be on top, not just for our soldiers, but for themselves too,” he says. Troops are still in the area to assure that the terrorists could not make any volatile assault both to the civilian and to the government forces after foiling their attack. Meanwhile, he further stated that the 8ID is very much firmed to sue those who do not show intention to cooperate with the government and keep on staging chaos to the people while the government is also pitiful to give another chance to those who really wanted to re-experience the life in the open. “Let our people’s desire for peace be prospered for they are already tired of waiting when they will re-experience peace and development in the region. Despite of their voluntarily giving of share to lessen the burden of our government to fast track this insurgency problem that mocks the decent living condition of our people, there is a need for serious collaboration to put this an end. And that, all sectors must join hands and equally contribute for the eventual defeat of insurgence in Region 8,” concludes General Chan. PASAY CITY – Senator Pia S. Cayetano is determined to push through with more public hearings this year on the controversial Reproductive Health (RH) Bill even if the measure doesn’t figure in the priority legislative agenda of the current Senate leadership. Cayetano, a member of the three-person minority bloc in the Upper Chamber, chairs the Senate Committee on Health and Demography which is overseeing public deliberations on Senate Bill No. 2378, the Senate version of the RH Bill which is authored by Sen. Miriam Defensor-Santiago. “There is a legislative process that must be observed and as Chair of the primary committee that is hearing the RH Bill, it is my duty to take the proposed measure through said process, whether or not it falls under the priorities of the current Senate majority,” she stressed. “We have already conducted our initial public hearing last year and we intend to set the succeeding hearings early this year,” added Cayetano, referring to the committee’s first public hearing held in October 2010 where resource persons from the so-called ‘Pro-life’ and ‘Pro-choice’ groups were invited, as well as experts from the medical community, women’s groups and key government agencies. Cayetano says there is a “good number” of senators who are either openly or discreetly supporting the measure, although she maintains that it is still too early to go into the “numbers game” at this stage. Aside from the RH Bill, Cayetano said the health committee will continue its work on other important measures, including on proposals to expand the coverage and benefits of PhilHealth and monitoring government efforts to meet its public health targets under the UN Millennium Development Goals (MDGs). It may be recalled that the very first measure approved on third and final reading by the Senate in the 15th Congress came from the health committee: the bill seeking to expand the national immunization program to include mandatory vaccination against Hepatitis-B for infants within 24 hours from birth. TACLOBAN CITY – The provincial government of Leyte is planning to host this year the “One Visayas” activity of the Regional Development Council of the three regions of Western Visayas, Central Visayas and Eastern Visayas. Leyte Governor Carlos Jericho Petilla said this is one activity that could help promote the province and the region as to its business, tourism and economic potentials. “We’re trying to see if this 2011, the One Visayas can be held here in Leyte. It does not necessarily have to be here in Tacloban as we have other cities as well in the region such as Ormoc and Maasin City in Southern Leyte,” Gov. Petilla said. One consideration, however, he added, is the fact that there is no available venue big enough to hold such a large gathering composed of participants from the bonded three regions in the Visayas area. Participants who gather to a “One Visayas” activity are coming from local government units, regional agencies, state universities and colleges and private sector groups of Regions 6, 7 and 8. “We really would like to have the One Visayas held here (Leyte) in 2011 and we’ll just look for a good venue for that,” added Gov. Petilla, who is also the new chairman of the Regional Development Council in Eastern Visayas. Previous hosts of the One VIsayas activity were Cebu held at the Cebu International Convention Center and Roxas City held at the Gerry Roxas Foundation (GRF) Convention Center. The RDC-8 hosted one activity of the One Visayas in 2010, dubbed as tne Visayas Health at the Leyte Park Hotel in Tacloban City. The RDC 8, played host to the affair, in partnership with the Department of Health-Center for Health Development 8 under the leadership of DOH-8 Regional Dir. Edgardo Gonzaga. The Forum was a sequel to the RDCom’s series of One Visayas activities. Prior to the Health Forum, the One Visayas Culture and Arts Festival, the One Visayas Climate Change Summit, and the second One Visayas Culture and Arts Festival were separately held in Cebu and Roxas City, respectively. These were initiatives of the three RDCom to bond together the development agenda of Regions 6, 7 and 8. One Visayas is the brainchild of and is led by the chairpersons of the Regional Development Councils of each of the three regions, Antique Governor Sally Perez for Region 6; Cebu Governor Gwendolyn Garcia for Region 7 and former Calbayog City Mayor now Samar Rep. Mel Senen Sarmiento for Region 8 who formerly headed RDC-8. It is aimed to have a cohesive promotion and development of One Visayan culture and arts as an important tool for the development of the country. QUEZON CITY – “In no certain terms and conditions would the Maoist terrorist CPP-NPA-NDF give in and jointly seek the path towards peace with government. But their unwavering demonic obsession seeking the collapse of our country’s democracy and government remains high and above all,” said ANAD Rep. Jun Alcover as he slammed the claims of Maoist terrorist CPP-NPA-NDF stalwarts Jose Ma. Sison and Jorge Madlos, in separate statements, that defended (sic!) their revolutionary group’s continued extortion, in the guise of “revolutionary tax”, against big businesses, including mining companies; groups and individuals. “I am so much concerned about this especially with the forthcoming peace talks just a month away and the non-formal discussion in Norway already set on January 14 to 18, 2011. Sison’s cabal of pretenders is acting as if they have a legal and constitutionally established government in this country,” said Rep. Alcover. Rep. Alcover expressed exasperation on the seeming reluctance of government, under President Benigno Simeon Aquino III, to impose its legal mantle and authority against the Maoist terrorist claim. “While it is the responsibility of government to reach out and hold discussions for peace with any group, it does not follow that any group that government is talking to could assume legitimacy of status and allowed to establish its own system of governance,” Rep. Alcover said as he emphasized that there is only one government in the country duly established by the constitution. “ANAD is deeply concerned about these unfolding developments where government seems reluctant to impose its authority over all groups espousing de-facto authority of governance, particularly on the imposition and collection of taxes,” Rep. Alcover explained. The statements of both Joma Sison and Jorge Madlos should cause government’s serious concern. “Issuing statements expressing its intention to continue extorting from mining companies, businesses, and individuals, under the highly surreptitious and deceptive claim of pro-people programs of the Maoist terrorist CPP-NPA-NDF, is tantamount to open declaration of belligerence against a constitutionally established government,” Rep. Alcover stressed. “Thus looking few steps further and in relation to the forthcoming peace talks, the Filipino people and government should not expect any thing positive to come out. Maoist terrorist twitting and dubious display of character is always evident so as their insincerity and utter disregard for peace,” he quipped. “President Aquino and his political advisers are now put on the spot. They should not forget that the Filipinos have already grown tired of being toyed with the idea of holding peace talks yet nothing concrete and positive were achieved, so far. Now, the Filipinos are closely watching every step and move that government does. We shall hold the Aquino administration responsible if anything dismal comes out of this latest effort towards peace with the Maoist terrorists,” Rep. Alcover emphasized. CAMP LUKBAN, Catbalogan, Samar – Continuous rain that started in New Year’s Eve up to present had brought some of the places in Samar and Leyte Islands to sink in a deep flood while some experience minor and major landslides. In Samar island, reports that had reached to this command divulged that there are five (5) sections of the Taft-Buray road which are inundated by three feet to five feet water flood of Barangay Binaloan, Malinao, San Pablo, Mabuhay and Burak all of Taft, Eastern Samar. Some vehicle cannot exceed even the military vehicle on the said areas. The Disaster Relief and Rescue Unit (DRRU) of the Army’s 801st Infantry Brigade in coordination with the Local Government Unit of the concerned municipality had already made necessary actions. 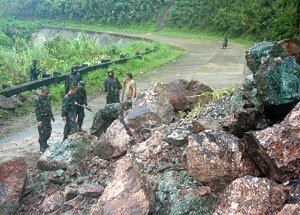 Trainees of Jungle Warfare and Mountain Operations Course (JWMOC) who are based in Hinabangan with some crews of Provincial Public Works and Highways (PPWH) in Samar were able to clear off the mud and rocks that covered the road net in Brgy San Rafael West and made it partially passable at about 11:30 in the morning. Complete clearing will be conducted the next day. On the other hand, Loop de Loop detachment of 52nd Cadre Battalion and 14th Infantry Battalion, respectively unmindful of their safety and heavy rains, were able to immediately deploy their troops to assist the trapped commuters but no possible evacuation of the trapped commuters thereat. In Southern Leyte, a separate report from R3, PNP Region 8 disclosed that landslides had occurred at Purok 4, Brgy Bolod-Bolod, St. Bernard at about 1:30 in the afternoon that buried two (2) households with three casualties. Combined personnel of PNP St. Bernard and 2nd Platoon of SL PPSC led by P/Insp Bernardino had already conducted initial search and rescue operation that resulted to unearthing of two (2) dead bodies that was later found out to be Fatima and Rodel Escairal, 5 and 1 year old, respectively while Jordan Laquipon, 1 year old is reported missing. Other residents near the area were already evacuated in safer ground and now under custody of St. Bernard Municipal Disaster Coordinating Committee. Search and rescue operation are still on going for the other missing victim. Furthermore, 19th Infantry Battalion lately reported that another landslide had occurred at Brgy Kawayan, Libagon town of same province that made the road from and to Liloan town impassable. Buses and other means of land transportation are reportedly stranded on the said place. 19IB had already deployed its troops to provide necessary assistance in the affected area. Troops are still in the area as of press time. Meanwhile, the commander of the Army’s 8th Infantry Division Major General Mario Chan ordered his Commandant to prepare the Command’s DRRU to augment the troops who are conducting search and rescue operations in the affected areas. Equipped with their DRRU equipment such as shovels, floating vests, ropes and other digging and floating devices, the Company size DRRU were formed stand by at the command’s grandstand ready to move on call for any deployment in any place of Region 8. TACLOBAN CITY – Over 2,300 workers of the government of Leyte received additional bonuses amounting to P10,000 during the Christmas season as announced by Gov. Carlos Jericho Petilla during the capitol Christmas Party held at the Capitol Grounds in December. The bonus is on top of the salary differential on the 10% salary increase for calendar year 2010 which the governor gave a green light. Announcement of the amount for the extra cash gift was the most awaited part during the Provincial Christmas Party for the more than 2,000 capitol employees. Gov. Petilla said it was a hard battle between the government employees association and his office as to the final amount that should be given to the employees as additional bonus. “It has been a long deliberation between the officers of PAGE as to how much really, can the province give, considering that we have already reached our salary cap for the year 2010,” Gov. Petilla said. It was learned that expenses on personnel already reached the 45% cap from the total budget of the province. Still, the governor added, his administration would find ways to come up for the additional bonus so that employees can still have money to spare during the Yuletide Season. The salary differential that is being given covers only the 10% salary increase from January to December of 2010. Salary increase for 2011 has yet to be decided upon, the governor said. Job order workers likewise received P5,000 each, the same they got last year. Though the announcement was applauded by the capitol employees who attended the party, the amount was far from the P22,500 the employees received last year. As per the governor’s order, the additional bonus and salary differential is to be released before December 25. However, only the additional bonus was released before the appropriated date while the salary differential is waited upon to be received this January. Meanwhile, the New Year brings good tidings to local government employees as they are set to receive hefty salary increases in 2011 per Local Budget Circular No. 9. Local Budget Circular No. 95, which was released on June 29, 2010, provides the guidelines for the implementation of the second tranche monthly salary schedule specifically for local government personnel. The salary increase for local government employees will take effect on January 1, 2011, six months later than those working for the national government. The increases range from 75 percent for the poorest towns to a hefty 100 percent for the richest or a doubling of the salaries of all their employees. Consultants are not included in the increases. The provincial government of Leyte, for its part, has yet to disclose if it could implement the said increase as provided in this recent local budget circular. QUEZON CITY – Government intends to acquire some 300,000 hectares of private and public estates next year for redistribution to agrarian reform beneficiaries, Cebu Rep. Eduardo Gullas said Tuesday. For this purpose, Gullas said a total of P10.179 billion has been set aside in the 2011 General Appropriations Act. The P10.179 billion is 15.4 percent or P1.363 billion greater than this year's P8.816-billion allocation for the land acquisition and distribution plan of the Department of Agrarian Reform (DAR), Gullas said. "The fresh funding will enable the DAR to take over some 200,000 hectares of private land and 100,000 hectares of public land, and then parcel the estates out to small landless farmers," Gullas said. Gullas made the statement as government prepared to renew formal peace talks with the National Democratic Front (NDF). Confiscatory land reform – the seizure of estates owned by "big landlords" and the subsequent redistribution of the holdings to "landless peasants" – formed part of the NDF's original 10-point program put forth in the 1980s. Gullas said the 300,000 hectares targeted for acquisition and dispersal next year would cover around 20 percent of the residual undistributed lands. Thus far, government has awarded a total of 7,558,777 hectares of land to some five million agrarian reform beneficiaries countrywide, leaving only 1,485,295 hectares still undistributed, according to the DAR. In August 2009, Congress passed Republic Act 9700, which extended by another five years the land acquisition and distribution schedule under the Comprehensive Agrarian Reform Program of 1988. Under the law, the DAR has up to June 30, 2014 to complete its land procurement and dispersal plan and expand the economic opportunities of small farmers who currently do not own the land they are cultivating. President Aquino previously indicated that once the land acquisition and distribution plan is completed, he would rectify the overlapping functions of the DAR, Department of Agriculture and the Department of Environment and Natural Resources. QUEZON CITY – The proposed P1.645 trillion General Appropriations Act that Malacañang will sign into law on Monday is expected to help address mounting unemployment, Cavite Rep. Elpidio Barzaga Jr. said Sunday. "Government is the country's single largest consumer and biggest employer. Its spending will help propel economic as well as jobs growth next year," Barzaga said. Barzaga said government would pay out some P526 billion in salaries and benefits to public sector workers next year, thus driving household consumption spending. "Government spending will stimulate in a big way the demand for goods and services, and in the process energize local industries," he said. Domestic industries benefiting directly and indirectly from the spending are bound to create new employment, according to Barzaga. Next year's budget represents almost one-fifth or 18.2 percent of the country's Gross Domestic Product, he added. Barzaga said the budget's P148.2-billion fresh allocation for new public infrastructure spending would also be another driver of jobs growth. "A provision in the budget requires contractors to adopt a labor-intensive mode of implementation of infrastructure projects. Priority hiring will be accorded to the underprivileged residents of local communities where the projects are located," he said. Barzaga said the infrastructure spending would benefit poor households, mainly through construction-related jobs. Meanwhile, the P6.6 billion budget of the Department of Labor and Employment (DOLE) includes P700 million for the Training for Work Program of the Technical Education and Skills Development Authority. Barzaga said the program would benefit 50,000 job seekers. He also said P425 million has been set aside for the DOLE's Capability-Building for Employment Service of Students and Workers' Income Augmentation Program. Another P300 million has been allotted for the department's Employment Placement Facilitation Program, plus P21 million for Labor Market Information and Networking Program, Barzaga pointed out. In terms of direct hiring, he said government would be creating 14,000 new posts next year – for 10,000 teachers and 4,000 police, fire and jail officers. Barzaga's remarks came not long after the latest Labor Force Survey showed that some 2.8 million Filipinos were totally without jobs in October, up from 2.72 million in the same month in 2009. The survey indicated that some 80,000 able-bodied Filipinos aged 15 years old and above joined the ranks of the unemployed over the 12-month period. The number of underemployed Filipinos – those only partially employed and actively seeking longer hours of work – also increased by 260,000 heads over the same period, from 6.88 million to 7.14 million, according to the survey.